Located in the mountainous region of Quang Ngai, schools for ethnic minority students are often far away from residential areas, students therefore walk all day and through slippery roads to schools; sometimes, they must stay in school in meagerly built bamboo camps. Seeing the condition, an enterprise has sponsored to build 20 shelters from containers for students as container houses. Students of Primary and Secondary School Tra Lanh in the mountainous district Tay Tra in Quang Ngai Province are exhilarated to live in such special houses. 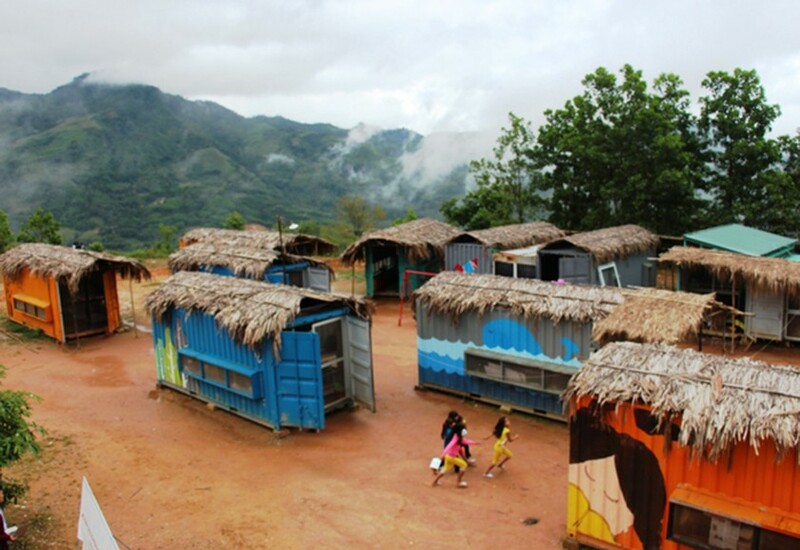 20 container houses become shelters for nearly 200 primary and secondary students. These containers are beautifully designed with different tidy section for learning and sleeping. They are provided with mosquito nets, mattress, fans and tables for learning. 8-10 students live in one container houses. Headmaster Le Van Tu said that the school is the only one in the mountainous district to have container houses. After five months, students are elated because they no longer live rough shelter from old pieces of wood set up by their parents which can not resist rain and cold wind.